Lately I have been working on my baler between rain storms. 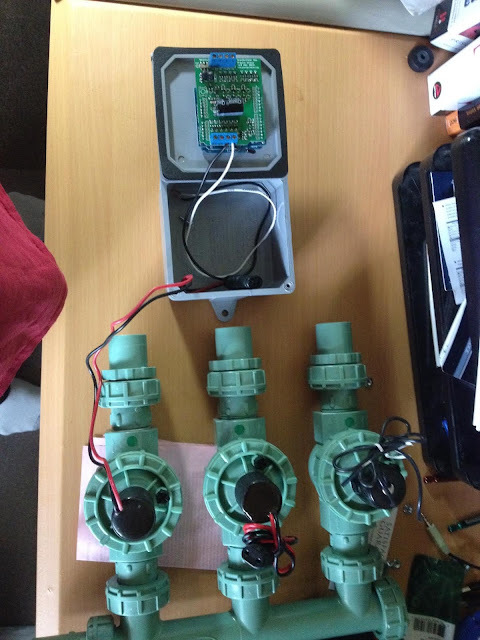 However, during the rain storms I have continued to work on my vineyard irrigation controller. Not that the grapes are going to need watering any time soon. But there will come a time and I must get this moved forward. I have a large aluminum panel mounted to my steel pipe fence with a water hydrant next to it. I have my three zones of irrigation pipes running up to this panel (just underneath it). I have purchased a three zone manifold valve system from Orbit and equipped it with two 24VDC solenoids. The black object on top of the green valves is the solenoid. The 24VAC ones have two black wires. The 24VDC solenoids have one red and one black wire. The red goes to the set screw terminal and the black goes to the reset terminal of the zone. This is a really easy thing to do. The manifold will be mounted on the lower left of the panel just above the zone pipes. There is no need for me to put these in the ground as it is more of an industrial installation. The aluminum panel faces north so nothing will get direct sunlight, which here in East Texas is intense. Currently the aluminium panel has just a water filter mounted on it. I welded Unistrut ( this is the funny C channel electricians use) to the pipe fence then bolted the panel to the Unistrut. It makes taking the whole panel off really easy should it be necessary. Back to the controller. Just above the valves I will be mounting a 4X4X2 inch plastic electrical box. I got this box from Home Depot. I comes with a waterproof cover and mounting tabs on each side. This is a shot of it open with the cover reattached backwards. As you can see from the above photo I will be mounting my ardweeny and support shields to the cover of the box, not inside the box. There will be one or two access holes in the bottom with water tight entry fittings through which the wires will got to the valves as shown in the first picture. There will be three shields to the system. Ardweeny, XBee and Valve controller, all stacked as shown. The really key thing here is that everything will mount to the cover, not inside the box. I have several reasons for this. All fall under the category of convenience. When I open the box and reverse the cover as shown, everything is readily available. I can access the usb port without problem. I can remove any or all of the boards conveniently. I can work with the enclosed wiring without having the shields also in the box getting in the way. If I need to I can remove the entire controller just by disconnecting a few wires and take it away. The entire box stays mounted in place. Oh and by the way, since there are no screws on the back the box will site flat on the surface of the aluminium plate. The Orbit manifold I purchased from Lowe's. They usually have them in stock. They come with everything you need including 24V AC solenoids. I think I paid $54.00 for it. I bought two 24V DC solenoids off Amazon that were "used" actually only the packaging was used for $7.00 each. The third I will buy from Lowe's locally as they are in stock and only cost about $10.00. They simply unscrew. My 24V DC solenoids came with a little gray adapter that has to be removed and then screw it into the manifold. I can take some pix and send them if you like to describe it. Rain protection. None required. This stuff is meant to be in the ground. 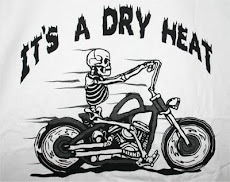 It gets wet. Everything will be mounted on a vertical plate of aluminium. If one wanted you could simply add a little roof shelter at the top of the aluminium, but I do not plan to. The 4X4X2 box is water tight. The connections coming in from the bottom mean rain can't enter unless it rains uphill. I mentioned water proof connectors on the bottom will also prevent wasps, and other critters from getting at the circuitry. I may put a little roof cover above the keypad like they do for gate openers that you drive up to. I will seal any entry points such as the keyboard cable entry with silicon sealant. I plan on powering this with either a 9volt battery or a combination of 9volt and three AA's. This way I won't need to have a regulator. I plan on having it shut down through software much the same way as your remote temperature sensor works. The jury is still out just yet on this. I plan to liberally and unashamedly steel Dave's software......Hee Hee Hee. He's done a great job and created a voluminous library of functions that will save me from reinventing the wheel. I chose to go with Ardweeny because there is a nice little shield for it that fits the Arduino form factor. I can do all my testing and code development with the regular Arduino and then simply replace it with the programmed Ardweeny. No other special mouning requirements. I have the shield on order and as soon as it arrives I can drill the holes. I plan on a next issue of this showing how I will use insert nuts that have a built in standoff of about a 1/4 of an inch to mount the Ardweeny shield to the cover and gluing up of the finished numeric pad. There will also be more discussion on powering. I am thinking of a second box that could house a small motorcycle battery. I found one for $25.00. The big thing on this to remember is that this only will run through the summer months so I could conceivably charge the motorcycle battery once a year and run it all summer. More to come on this note. Still a few things to think about with this yet. I'm not sure about a led in the outside of the cover plate that will illuminate when you push the button. I'm thinking that the clicking sound of the solenoid plus the rush sound of the water in the pipes might just be enough. Needs to pass the "wife" test though. So there you have it. The main theme of the blog is really "Don't forget the cover" and the benefits it affords for mounting options. This is Dave again, I have a comment, AWESOME. I've been using those waterproof boxes from Home Depot for quite a while for various projects and it never, ever occurred to me to mount everything to the lid <link>. Simple idea that I should have thought of. Yes, I'll be stealing that idea and others from him. 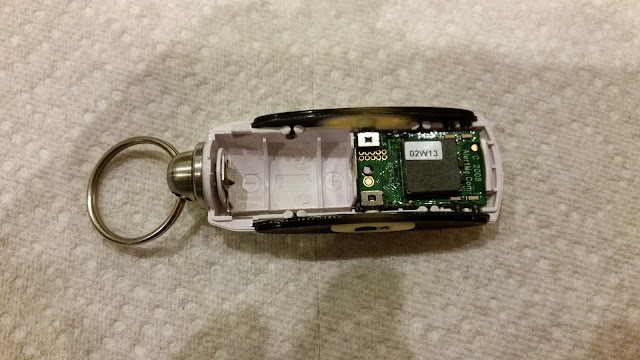 Last time I described the Key Fob that Lowe's sells and previous to that I showed the Door Switch, but I haven't shown you the way I got them to work. I'm still a little reluctant because my partner in this project hasn't succeeded in getting his devices to work properly, but it occurred to me that someone out there might pick up the code and give it a try. I know several folk have used my Smart Switch code to control and monitor things around the house, maybe they're just waiting for me to publish how to do it. I have eight devices, five of the smart switches, two door switches, and a key fob, and all of them are working with the same monitoring code. The code is only to monitor the devices, there's no provisions for control, Actually, the only thing you can control is the smart switches, and I've already posted code for that, so this will show you how to monitor all the devices. This code works pretty easily, pull the battery out of the device, start the code, put the battery back in and push the button eight times quickly. The switch will contact the code and join on its own. Once joined, the door switch and key fob will send status every two minutes telling you they're alive and in range. The smart switches send status much more often with a cumulative status every minute. If you want to join other devices, just pull the battery, put it back, and push the button a bunch of times; joining is always enabled and the next device should work fine. Stopping the code (cntrl-C) and restarting it won't cause the devices to leave the network, they'll be fine when you restart the code. I did this a LOT when I was trying to get them to work. 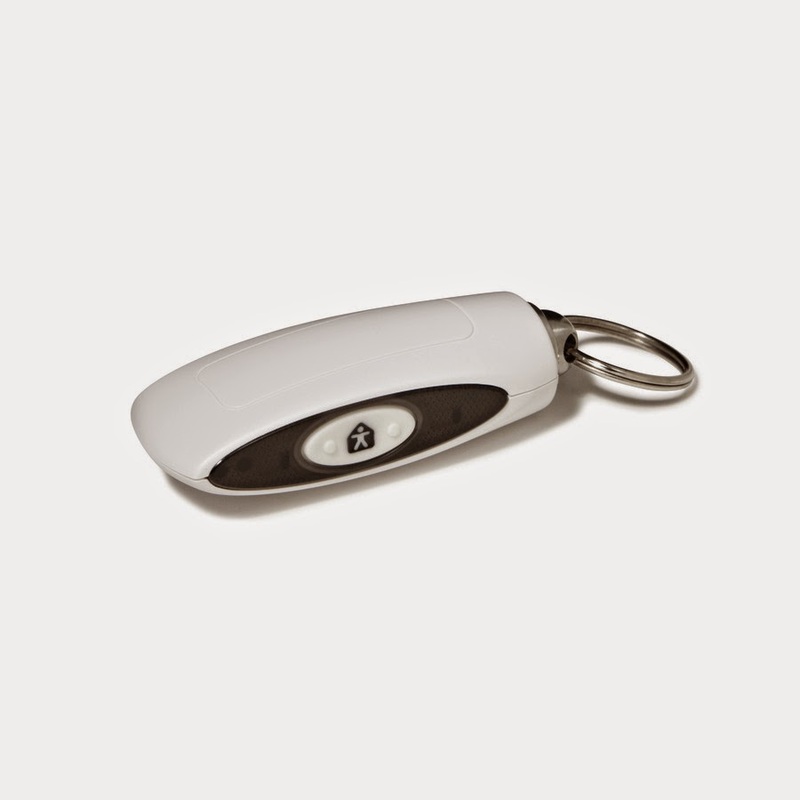 Once running, you can press a switch on the key fob and it will transmit a messsage telling you that the button was pressed or released along with a counter that represents the time in milliseconds off the action. By subtracting the released time from the pressed time you can look for a long press as opposed to a short press. Nice feature. The door switch has two switches, a tamper switch that will tell you if the cover is taken off and a reed switch that tells you the door has been opened. The tamper switch will tell you press and release like the key fob does, as will the reed switch. This means you can tell if the door is opened or closed as well as the cover off or on. Like the smart switches, the key fob and door switch once joined, stay that way. You can pull the battery and put it back in without it having a problem. You can also drive away out of range and come back and everything works just fine. If you kill the coordinator by pulling the power or something, you might have to make them rejoin. This all depends on how long it was off and what happened during the off period. Sometimes the coordinator XBee will choose a different channel and then the switches will have trouble finding it. A simple power failure won't cause any problem, but reloading software to the controller could mean a visit to the devices to force them to rejoin. This kind of problem can be avoided by using the parameters on the XBee controller to limit it to a single predetermined channel. Doing this means the XBee comes up, establishes a network on the channel and the devices then just continue on as before. So, you're going to get a lot of data as you add devices. Each device will interact at least every couple of minutes and every time you mess with them. For me, this meant missed messages. The traffic was pretty steady, but things didn't look right until I added a queue to the code to hold the messages and took them off one at a time to deal with. There's plenty of unused time to handle the messages, but they tend to come in in bunches and can cause problems. Adding a queue seemed to help that problem a lot; I don't see any missing or partial messages when I run it. There's lots of debug and logging in the code as well as a test to help you isolate a single device. You'll see it in the code; I look for a list of devices to listen to and ignore the others. I had to do this to keep the other devices on the network from confusing me when I was trying figure out which bit meant what. Look for the test at the top of the code to decode the messages and adjust it as you need to. Also, this doesn't save anything from one run to the next. There's no database of devices that gets updated and the state of the devices isn't saved to compare with later. Once you're comfortable with the code, simply add whatever you want to handle things. I'm going to hook this code in with my database of house devices to save the states and decide exactly what I want to do with it later when I have a little more experience. and put whatever you want to watch in. print "Sending match descriptor response"
# some time to digest the messages. # This is the device announce message. # initialization, this command seems to take care of that. # So, look at the value of the data and send the command. # be handled in turn without one interrupting the next. Yes, it's a bit complex. More complex than other hacks I've posted. I had to do this to allow for multiple devices that had multiple endpoints and clusters involved. It still isn't too hard to understand, and you should be fine when you start messing with it. The first field is the Unix timestamp. Basically the number of seconds since 1970. The second is the long address of the device; this never changes. Then the cluster id followed by the data specific to the cluster. 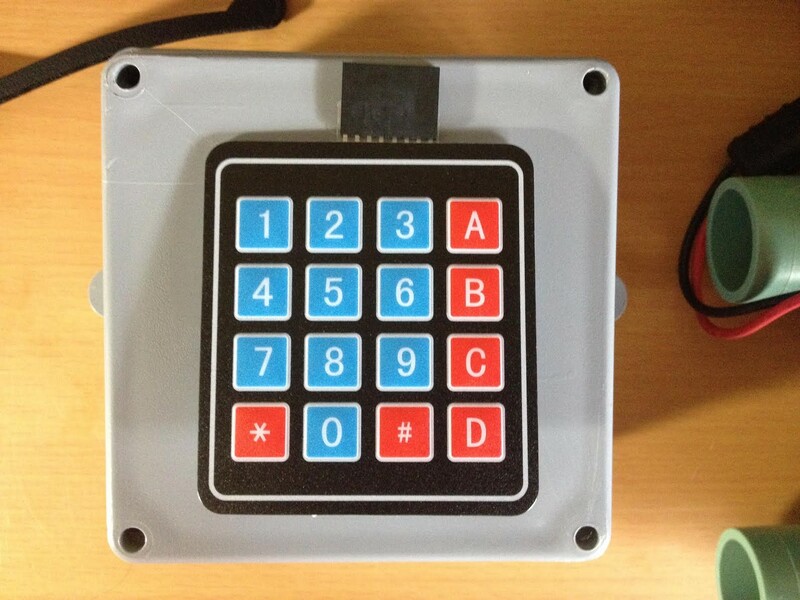 I decoded the times for the key fob and the temperature for the door switch because those could be fun to play with. Notice that the smart switches really send a lot of data, this will help you understand why I limit the number of devices with a test at the top of the code. If everything is there, you have a heck of a time picking out what you want to see. The list of know devices is the long address and the currently assigned short address. The short address will change from time to time as you restart the process or pull a battery somewhere. Remember, this runs on a Raspberry Pi, I haven't tried it on anything else. I have my XBee plugged into a USB port on the Pi, if you're using the serial port, just change the port in the code, that should be all that is needed. If you don't know which usb port to use, there's a ton of articles on the web that will help you find the port, just look around a bit, or to see how I did it look here <link>. What I'm hoping for is a couple of folk that want to use these nicely priced and well made devices with their own code for some project to grab it and give me some feedback on the interaction. It would be nice to see someone else running this code. Yes, I've made some progress on this project, but first let me talk about why I'm bothering with this. A couple of folk have asked me why I hack into these devices in general; the answer is not an esoteric, "Because they're there." I enjoy the challenge, but mostly it's because I want to use them without a bunch of strings attached. The Iris devices are fairly priced, but not if you have to subscribe to a service that cost $10+ a month for the rest of time. From dismantling them I can tell the construction is actually pretty well done even though I keep seeing complaints on the web about how they should be smaller, prettier or come in colors. I couldn't build one as nice for the price. Actually, I couldn't build one as nice for twice the price. The single disadvantage is that their usefulness is tied to a web site that is run by a corporation that can change their mind at any time about anything and leave me hanging. Been there, done that, want to avoid it in the future. 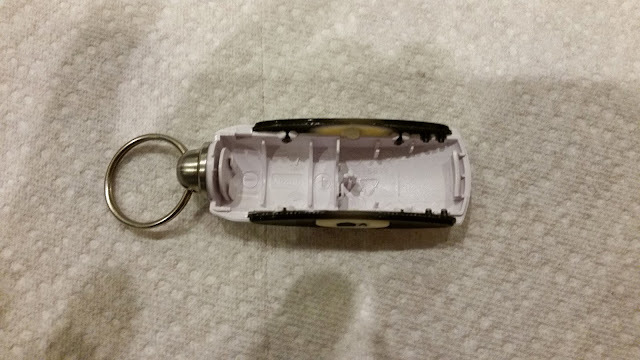 Enough philosophy, I'm going to talk about the Iris Key Fob a bit. When I got some reaction from the door switch, I wondered if the key fob would work in a similar way, so since I was going to town anyway, I stopped off at Lowe's and picked up another door switch (I have two now) and a key fob as well. Here it is with the cover off. Same good construction as the door switch with a pair of switches that you press to activate funtions remotely. Let's pull it apart. You can click on the picture and zoom in if you want. The switches have tactile feedback so you know you pressed it and the battery seats firmly so you know it's in there. Nice switch, albeit a bit large for some people's taste. This switch was designed to control the Iris system in a home. If you push one button, it arms the alarm, and the other switch disarms it. It also provides feedback to the system that the fob is in range. People describe it as the Iris Hub sends messages to the fob every two minutes and if it doesn't get a response, the hub arms the alarm. My reading of the messages that fly back and forth shows that the fob reports every two minutes to the hub, so that would mean two minutes without a message and the hub will arm itself. There may be something I'm missing, but I'll turn it up eventually. I see this device as two remote control switches that I can do any darn thing I want with. It could be on and off for a machine, light, ceiling fan, whatever I want. I can have one in each room attached to the bed for ceiling lights, or turn off the smoker in the yard if I want to. I can hear my readers saying, "Fine, nice pictures and philosophy; tell us how the interaction works and give us some code." Well, I'm going to make you wait a couple of days before I bury you in code because this gets somewhat complicated and I'm not sure I've got enough bugs out to trust it yet. I have two door switches, a key fob and five smart switches running on the same XBee controller quite reliably, but a reader who 'volunteered' to try the code also has had nothing but problems. Where my stuff joins and just works, his decided to get flaky and mess with his mind. We're trading logs and code back and forth to try and figure out what's different. 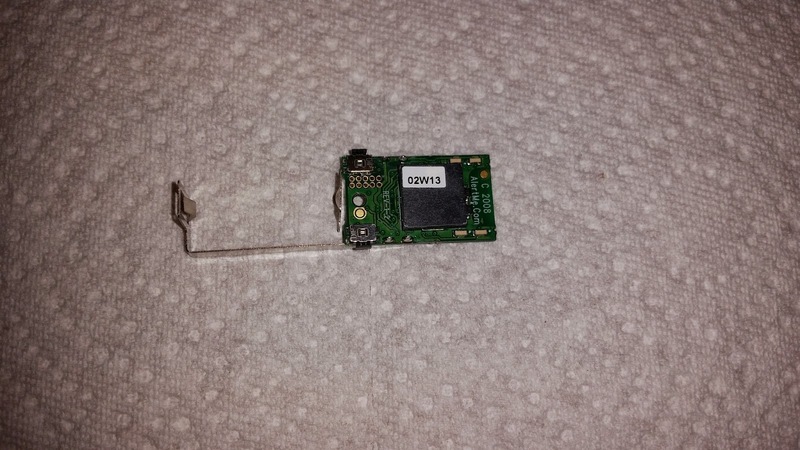 More later, but you got a look at the internals of a device, so stop complaining. Just when you thought I'd finally shut up about the AcuRite weather sensor I decide to post again. I promise, at some point I'll actually be satisfied with this device, but not quite yet. Over the months I've been working with this I've received comments and emails from folk that tried it and discovered things. One reader had an especially interesting situation; he had a neighbor that had a sensor within range. This meant that the code would pick them both up and present data from both sensors. To add insult to injury, when he tried changing his station to channel C, he found out that rtl_433 had a bug that prevented his receiving data on that channel. He must have been really annoyed at that point. Since wind and temperature matter to placement, this was causing him grief and he set off to fix it. 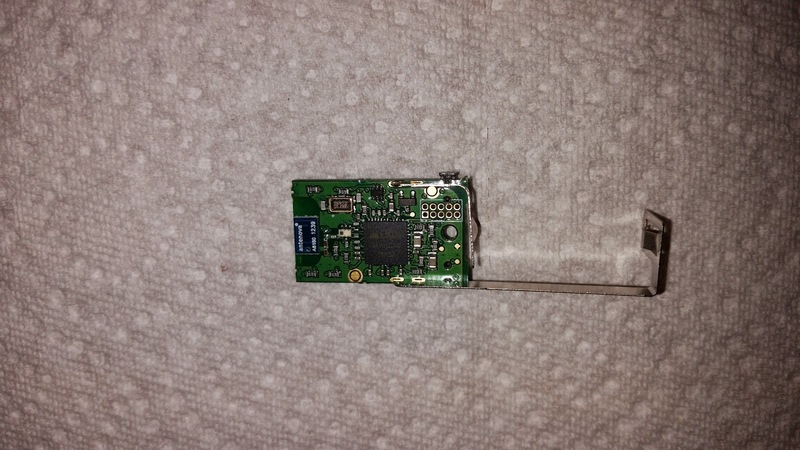 He isolated the sensor ID, and while he was at it, decoded the battery level, channel and found a better way to read the RF that allowed channel C to work. During his trials he also found that the checksum was allowing bad data into the decoding and would present unusual readings. I've seen this over time as well. Things like a wind gust of 147 mph, a temperature spike of 30 or so degrees for no reason, the usual outlier readings, but with weather, it's hard to tell what an outlier really is. I totally stole his ideas and some of his code and incorporated into my weather station,; I haven't been running it too long, but it looks like the vast majority of the outlier readings are gone. There may be some turn up, but so far it's been good. First, inspection of the data showed that the bytes holding the various readings were all even parity. I added code to check the parity and discard the message if it didn't pass. Note that I only check the readings bytes because the first, second and last bytes are sensor, status, and checksum; these don't incorporate parity. In the c code I add the decoded sensor id, battery level, and channel to the JSON string I output, then check for the proper values in the python code that receives it. I did it this way because some folk may want to catch multiple sensors and average or compare them; especially if they can see a neighbors device for free. I also noticed at my house that I receive a couple of devices from other folk that are not AcuRite devices. These things can cause problems as well, especially since they could easily be using the same checksum algorithm. All the changes meant that I had to get the very latest version of rtl_433 from the original github repository. This was required because the rtl_433 folk made a new decoding method available that works better with the AcuRite data stream. That decoder wasn't there in January, but it is now. So, I tried again to fork it and failed miserably, and wound up just updating my copy of rtl_433. But, another good thing happened as well. The folk that wrote rtl_sdr, the actual radio software have improved it a lot and it installed first time, and I got to remove that from my copy. The reason I linked to a particular commit in GitHub is so you can have exactly the same code to work with. The two rtl projects are in flux and could change dramatically at any time. You can always get the latest version if you think it will serve you better. The '-R9' specifies the 5N1 device. Notice how I save the stderr output to a file? That helps me understand how many errors I'm getting and could help me fix a problem. Right now I'm also using the -D for debug option as well to get more information. Try '--help' on rtl_433 to see the other options it has. I owe this latest version to Pcjunky (yes, I know his name, but I ain't gonna post it without his permission). He took my code and beat on it until it worked to his satisfaction. Thank's a lot. This calculates the parity for a byte in around five cpu operations. It's an extremely clever implementation that I leave the explanation as an exercise for the student. 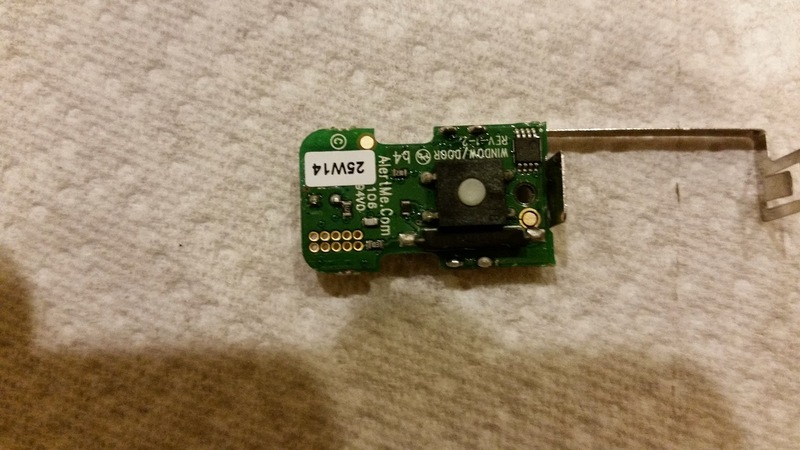 Several people have asked me about the Iris Door Sensor, and I haven't had much interest. My battery operated switch can do this and is totally programmable, but I figured, "What the heck." I went ahead and got one when I went to Lowe's to get another smart switch. Now, this is one of those projects that will go on and on as I try to get it to work. Meanwhile, these are the first steps. Magnet off center to be near the reed switch. Nice set of high quality components. this thing is put together pretty well. The important part is the Ember 250 SOC (system on a chip) that runs the device. 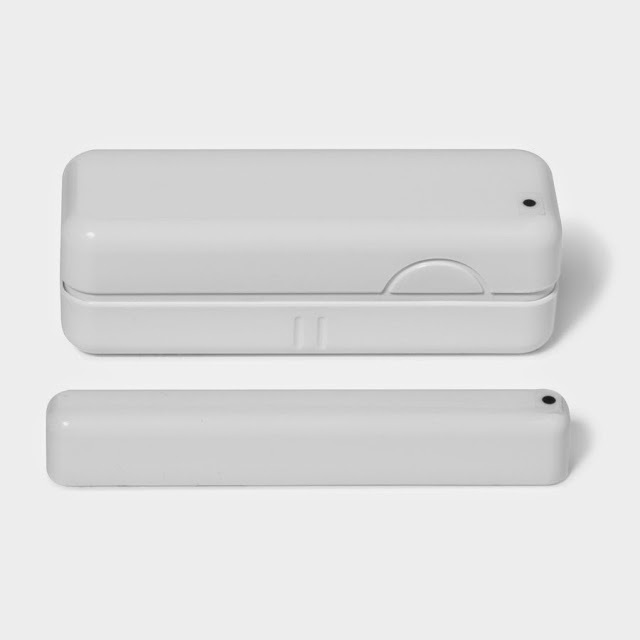 These are made specifically for ZigBee and are very nice devices; to bad the product comes from Alertme. They always ignore the ZigBee spec and go their own way in critical areas. This is going to make it tough to hack into. I put together some code and turned off my normal network to keep down interference and gave it a try. I couldn't get it to join properly, but I was able to see it trying. 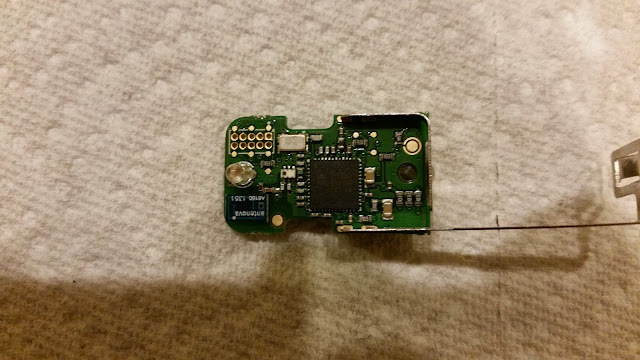 Since this is an Alertme device, it has significant API differences from the ZigBee spec, so I started trying things. I got it to join eventually by a non-reproducible accident and saw it running. The problem is that I can't get that to happen again. When it was working, I noticed that it was really sensitive to where the magnet was, so I looked at the reed switch specs and it's only got a 7 mm range. That means that the magnet needs to be right next to the sensor for it to close. The FAQ for the switch on the Lowe's site even talks about that. They blame it on polarity when it's really the fact that the magnet needs to be so close to the sensor; like polarity would matter on a reed switch. A neo magnet might make the range longer, but it wouldn't be as pretty. Some of us may have problems with that on installation; seven millimeters is not very much, especially when it's about 4 mm from the switch to the case. Do you see why they have those little protusions on the case now? 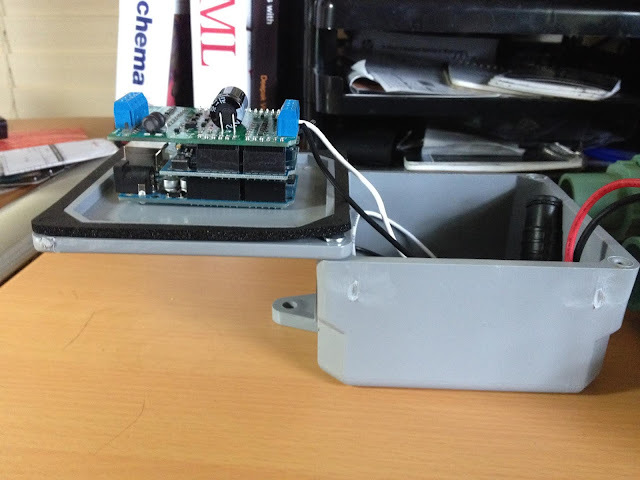 It gives some spacing and a little place for the magnet to rub on the sensor case when the door closes. Strange way to build it, but I'm not an engineer. About how it works: When the battery is first inserted, it starts sending Device Announce messages and continues this until I answer it with an Active Endpoint Request (which it hasn't answered yet). When it gets the Active Endpoint, it sends a Match Descriptor request and I answer it with a Match Descriptor Response tailored to it. Then, it sends one of the odd Alertme messages to profile 0xC216 that I've seen before from Alertme devices. This is the point where, with the smart switches, I send a set of canned responses back and the device would join. The door switch doesn't join, It will stay around for a while trying, but will eventually give up and move on to another channel to look for another controller. The time I got it to join, it started sending messages to cluster 0x500, the security device cluster. While it was doing that I could actually see the switch change state because the values it sent back were changing based on magnet location. However, it was erratic and extremely slow at sensing the magnet. There was some LED flashing on the device that seemed to correspond to the position of the magnet, but I couldn't be sure. I'm going to post the code I'm working with as it is right now, but it's not pretty. 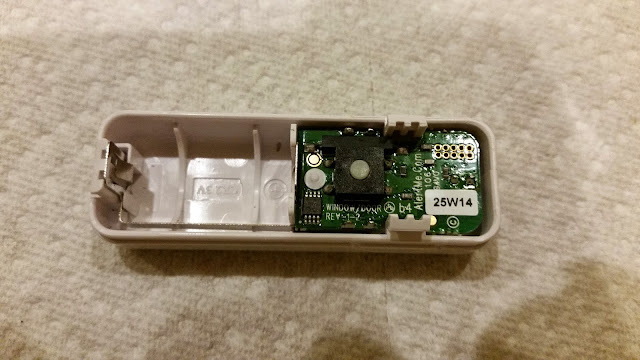 I hacked up a piece of code I developed to break into another ZigBee device and am making experimental changes to it trying to understand this door switch. If you grab it, there's an 'if' statement up at the top where I get the packets from the XBee, I check the incoming source address and skip anything that isn't coming from the switch. I have a number of the Iris devices and they were messing up the experiment, so I just ignore them in the code. You'll have to change that to your own devices address. needed the manufacturer specific bit yet. attributes command. This is not a ZDO command, it's a ZCL command. ZCL = Zigbee device cluster - the collection of routines to control it. # so there are attributes and commands to think about. if (data['rf_data'] == '\x08'): # was it successful? print "Didn't get all the attributes on one try"
print "sending Active Endpoint Request "
dest_endpoint = '\x00', # This has to go to endpoint 0 ! print "error parsing Simple Descriptor"
#            print "sending Active Endpoint Request "
#            print "sending 'configure reporting'"
I told you it wasn't pretty, so stop complaining. I'm continuing to play with this switch as time, and new ideas permit, so I think the door switch can be conquered. However, if is as flaky as the initial results would indicate, I may not be using it. 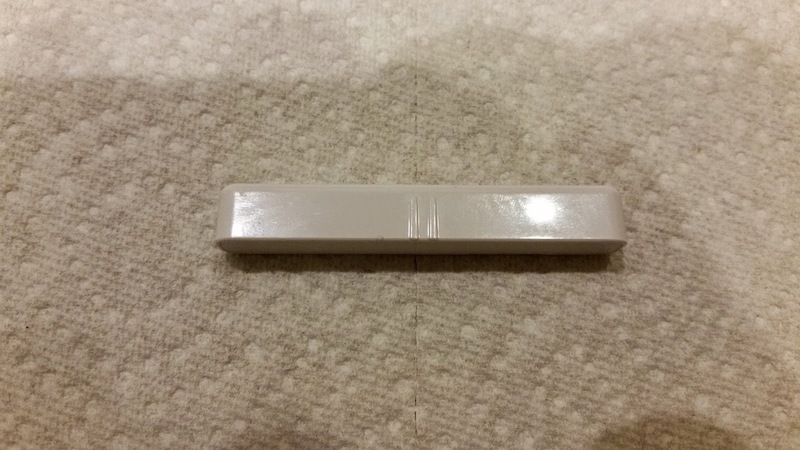 Having to have the magnet right up against the sensor and having so little elbow room would stop the switch from being useful on things like garage doors, doors that move due to weather or settling, wooden windows that may not shut all the way, that kind of thing. If someone has one that works well in an Iris setup can tell us about this switch, it would be great. If you want, grab the code, experiment, play, and let me know the results you get. The next post on this project is here <link>. Well, I did it. I finally broke down and bought a NAS (network attached Storage). I researched these things for days looking for something that would fit my needs and couldn't make up my mind. I was tempted to just take a Raspberry Pi and add a disk drive, but I wanted more capability in the device than that would have given me. I asked other folk, and it came down to two manufacturers of this kind of device: Synology and QNAP. Frankly, they both sound great and have more good reviews than bad. I settled on QNAP, not because it won out in the specification, but because I caught a nice sale. TigerDirect had the QNAP TS-231 on sale for $30 bucks off, so I ordered it. I got two 3TB WD red drives from Amazon and set it up. It's up in my attic data center working its little heart out. When I was looking at what could be run on it, MySQL was listed. That meant that I could put my house databases up there and get them off the Pi's I have running. It also meant that I could expand the database and actually log data locally for my house. Wow, that would mean all my griping about cloud services would end. First step, set up a MySQL database on the server; that took about 10 minutes. Then understand how to put data on it; that took a day. Then convert my code to use the new databases on the NAS; that took a stinking week. The very basic use of MySQL is different enough from the way to use SQLite3 that I had to learn a whole lot to get it working. But, when I did, it really sped things up. I'm not clear on why exactly; I'm making data base transactions across an Ethernet link instead of locally, but it runs faster. Since the NAS is set up Raid 1, I have 3TB to play with and I expect the databases to use a hunk of that so it may slow down over time as the data bases grow. My impetus for finally biting the bullet on one of these devices was storage failures on the Raspberry Pi. That's the most significant problem I've had with the Pi, the SD cards wear out, and I had worse luck using a USB stick. Well, I won't be wearing the cards out as fast, and I don't need the extra space of a USB stick anymore. However, the SD cards will still wear out because all the system logs and such are beating on them. To this end, I'm going to put the operating system on the NAS as well, but I haven't gotten that far yet. The idea is to put everything I can on the NAS and only boot the Pi from the SD card. That should make it last a while. Sort of the best of both worlds; the separate processor and hardware of the Pi combined with the storage and reliability of a NAS. I'll inherit the possibility of things quitting if the Ethernet fails, but my house already relies on Ethernet anyway. I have the various Arduinos set up to work in a default mode, so that problem hasn't gotten any worse ... I think. One of the side-effects (affects?? I can never remember which one to use) is that I cleaned up a bunch of code, removed things I really wasn't using any more and restructured a lot of my processes. So, most of the processes that wrote data to the various cloud services I looked into are gone now. The code is still out there on GitHub (the internet is forever), but it's not in the latest update. If you need it, just look at a previous commit. Another thing that changed is since I'm not updating the various clouds, the live graphs I have scattered in earlier posts may not work any more. I replaced some of them with pictures to keep it somewhat coherent, but gave up after a few. Also, the architecture of the overall house control and monitoring is a bit different. I guess I'll delete the page on that and try to create a new picture and description soon. I'm keeping my legacy feeds on Xively running for now since the majority of my data is there. I wouldn't mind losing that data, I'll make more, but I want to annoy them as long a possible with a personal feed. They've been hinting that they may remove the personal feeds for a while now, and I just plan on staying there until they kick me off. But, this thing is so cool. It just works and accepts transactions without complaining at all. MySOL is way capable and can do things I hadn't even thought of. So, Dave's place has Arduinos running things like the garage, pool and air conditioning that talk to a Raspberry Pi that saves it's status to a NAS. There's also a weather head that sends RF data to another Raspberry Pi that saves weather data cumulatively to the NAS as well. The code for the new way of doing things is out on GitHub, if you want to grab something.